Join us for one of the region’s best-loved holiday traditions, Candlelight Evening, on Saturday, December 8, from 3:00 to 7:00 p.m.
Find parking info and full schedule here. The landscape of the museum is adorned with greenery and aglow with hundreds of candle luminaries. Real jingle bells add to the magic of the evening as horses dressed in harness bells pull wagons carrying visitors through the museum’s snowy grounds. Gather around a bonfire on the tavern green and partake of complimentary wassail, made with local cider, warming in kettles over open fires – served throughout the event. Candlelight Evening is unforgettable for children. Saint Nicholas reads “Twas The Night Before Christmas” in the Filer’s Corners Schoolhouse at 4:30 p.m. and all visitors enjoy free rides on the Empire State Carousel, courtesy of Matthew Sohns and family. Music and live performances bring Candlelight Evening to life. See performances by the Catskill Chamber Singers, Snowflight, Sandy Peevers, Diane Ducey & John Davey, and the a cappella group, Enough Already. Local school bands play holiday favorites. Mingle and get great selfies with characters from the museum's upcoming production of A Christmas Carol. 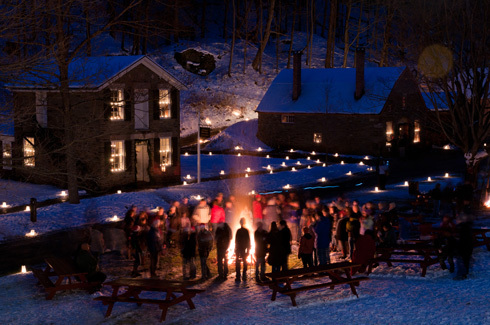 Best of all, visitors can join in singing with over 150 carolers in the midst of our candle-lit historic buildings. Warm up with delicious food and hot drinks at two locations. The Louis C. Jones Center serves a full dinner featuring your choice of beef stew or baked ziti and fresh baked apple crisp or gingerbread for dessert. The Crossroads Café offers homemade chili, hot dogs, and other snacks and drinks. Candlelight Evening is another chance to shop for the holidays. Stop at The Farmers’ Museum Store and Todd’s General Store where a large selection of products made in New York State are available - as well as toys, books, jewelry and other items you can only find at the museum. Candlelight Evening is sponsored in part by Excellus BlueCross BlueShield, Community Bank, Smith Ford, Haggerty Ace Hardware, Cathedral Candle Company, Dyn’s Cider Mill, and Bruce Hall Home Center. Free carousel rides sponsored by Matthew Sohns and family. Candlelight Evening is also made possible with public funds from the New York State Council on the Arts with the support of Governor Andrew Cuomo and the New York State Legislature. 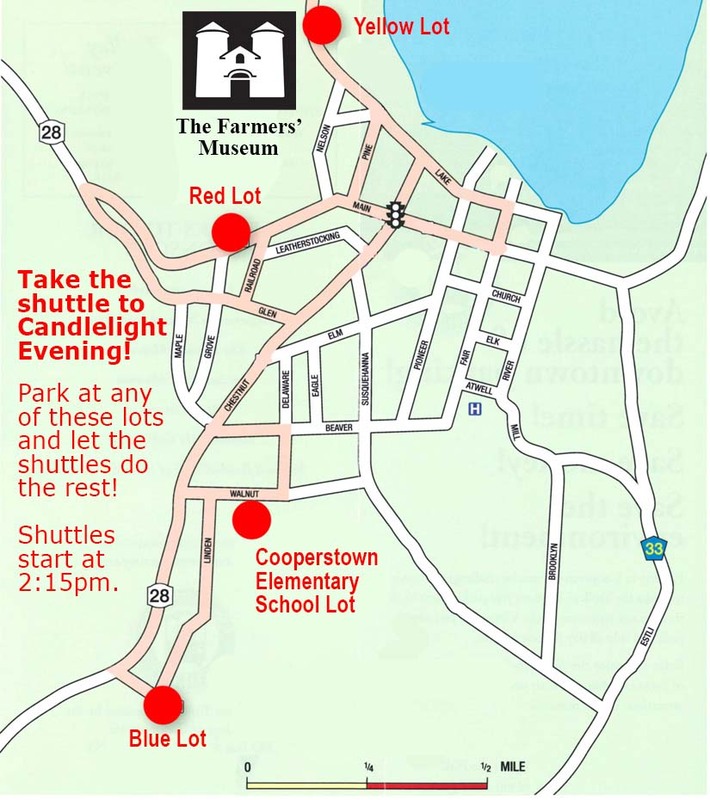 Parking and Shuttle: Free shuttle service starts at 2:00 p.m., serving the parking lots at the Otesaga Hotel, Cooperstown Elementary School, and the three trolley lots at the perimeter of the village. Visitors can also walk to the museum from the village and enter through the south admission gate. Schedule: Click here to see the full schedule of programming at Candlelight Evening.